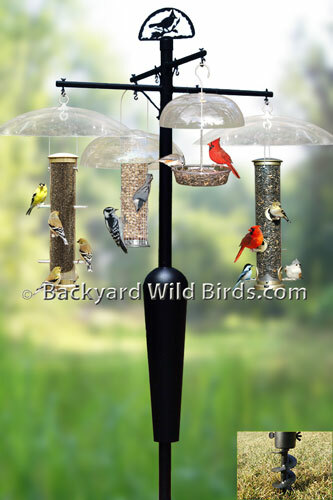 This Bird Feeder Pole with Bird Feeders is a complete system that is ready to use right away. This great kit incorporates a Squirrel Stopper Pro pole with pole squirrel baffle, many different Bird Feeders with clear hanging Bird Feeder Baffles above them. Can't you just see this bird feeder in your backyard? It is designed to attract the most song birds while the poles inverted pole baffle keeps its bird feeders squirrel proof and raccoon proof. This collection of bird feeders is one of the best. The right Sunflower seed bird feeder dispenses one of songbirds favorite seeds. The center Wild Bird Tray Bird Feeder with dome is a real nice multi-purpose bird feeder for assorted seeds, fruit, nuts or meal worms. The wire mesh Peanut Bird Feeder in the back can be used for peanuts, or different types of sunflower seeds. The Thistle Seed Tube Bird Feeder on the left has 8 slits to dispense narrow thistle seeds. Goldfinch and others love this type of seed. Together these bird feeders bring in a wide assortment of wild birds like: Cardinals, Chickadees, Nuthatches, Woodpeckers and Titmouse, etc. Bring this Bird Feeder Pole System A1 to your backyard and see all the birds you can attract. It is no wonder backyard birding is one of the most popular hobbies in America. Love your ideas for constructing bird feeders that are functional. Do you have any instructions pm how to install the racoon proof bird feeder?